There will be many hours during your day when you will be asked to stop and smile for a guest’s photo. However, the moments that we cherish most are the ones that aren’t captured in a single frame. A wedding is a dynamic event; the sights and sounds are constantly changing. For this reason, experience is what counts the most when it comes to capturing and presenting your special event. We know how to be in the right place at the right time. Our journalistic approach means that you can be yourself and enjoy the day with your guests. We do not require you to act, just react. 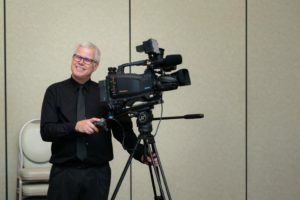 Almost everyone owns a camcorder these days…and many brides and grooms are approached by well-meaning friends and relatives offering to videotape their wedding, pointing out all the money they could save by using them instead of a professional Videographer. Unfortunately, there is no way their work can compare with the years of experience, multiple high resolution cameras and professional quality mixing, titling and audio dubbing capabilities we can provide. If you needed an operation, would you prefer a specialist who had performed hundreds of similar procedures, or a friend with a clean pocket knife and some first aid training? Your wedding day is special, you know it… and we know it”. We also know how complicated planning it can get. Choosing Vid-Cam Productions to produce your wedding video is designed to be uncomplicated and to stay that way throughout the process. At Vid-Cam Productions we make everything transparent… with a clear & easy to understand (and read) contract where you can easily see exactly who does what, when it happens, how much it costs. These days we are keenly aware just how important a wedding budget is and how hard it can be to stay within the lines. At Vid-Cam Productions we are up front with our services and pricing… no hidden fees… no hidden extras. We will work with you to make any budget work with us… guaranteed! Prepare for & invest in your family’s future now by saving this special day on a BluRay disc. Our talented team will produce a professional, high Prepare for & invest in your family’s future now by saving this special day on a BluRay disc. Our talented team will produce a professional, high quality film of your very special, once in a lifetime event that captures the joy, the love & the sounds of your wedding day. Think about how much fun it will be to sit down with the family in twenty years and show them what Mom & Dad looked & sounded like “back in the day”. At Vid-Cam Productions Wedding Video we want to make sure that your wedding video is viewable 40 years from now. Almost certainly there will be technological advances in the future of video. Remember VHS & Betamax? All of our clients receive a master archival Blu-Ray disk with each wedding video package. To insure your video investment, we encourage each of our clients to save your video in a safety deposit box it for safety. If and when the media technology changes you can easily transfer it to the new media yourself or… have Vid-Cam Productions do it for you. So many years from now, you can watch & re-live the incredible emotions of your special day. Just listen to the laughs… and watch the tears. Remember…Once the wedding day is over… it’s over. DON’T TRUST AN AMATEUR TO CAPTURE YOUR ONCE-IN-A-LIFETIME EVENT! I have been a professional broadcast and independent videographer, editor and studio camera operator for over 25 years. I have been in the professional broadcast television business for most of my life. In the mid 1980’s when home video cameras first came on the scene, I bought one to film my daughter growing up and was soon asked to tape weddings and special events for friends and associates. I bought a 2nd camera for a more professional look. For weddings, I added options like photo montages of the bride and groom growing up, interviews at the reception, and polished everything up with post production editing. I began Vid-Cam Productions in 1991, where I work to produce the kind of videos that, I believe, rise well above the competition. Artistic videography and the creative editing process are my greatest strengths. I especially excel in hand held videography and am meticulous about recording the best audio. I edit everything I shoot. When you do your own editing like I do, you know what shots go well together and this makes you a much better videographer. I am very passionate about my work and will personally film and edit your wedding or special event, guiding the whole process through with the utmost care and attention to detail. I will capture the tears, the emotions, all the happy and sad events that occur on your special day. I will produce a combination cinematic/documentary viewing experience that will exceed your expectations and become a treasure for you, your family and future generations to enjoy. Your special day should be remembered forever. Still photographers have been doing this for years. Videographers are also preserving this day, but they are adding life to it with moving images and sound. Here is what a previous client wrote to me recently: “While most brides focus more on photography for capturing moments throughout their special day, those who decided to have a professional videographer found the video to be just as, if not more important, as their wedding pictures.” Today, High Definition Cameras and editing systems are a reality for the Professional Wedding and Event Video Producer. This is a great benefit for my clients. With Vid-Cam Productions you will be able to view your wedding or special event in true Widescreen format, on High Definition Blu-ray, for the ultimate viewing experience. I think I am in the greatest profession possible. I have the ability to take you, your family and future generations through a window into the past so you can relive one of the most heartwarming and memorable occasions of your lives. For wedding couples, you can play your wedding video on your Anniversary, Valentine’s Day, or whenever you wish, to renew your vows and to reconnect as husband and wife. Looking back you will realize that preserving the wonder of your special day, on a beautifully filmed and edited Blu-ray, was one of the best investments you ever made.